Inner conductor (mm) : plain copper, ø 2.7. Dielectric insulation (mm) : gas injected foam PE, ø 7.25 ± 0.10. Braid : tinned copper, 128 x 0.15.
coverage : 70 % ( ø 7.95 mm ). Outer sheath : polyethylene, black (RAL 9004), ø 10.30 ± 0.18. Inner conductor (mm) : copper, 7 x 0.75. Insulation (mm) : PE, 7.24. Braid : 95 % copper. Outer diameter (mm) : 10.30. Inner conductor (mm) : silvered copper, 7 x 0,75. 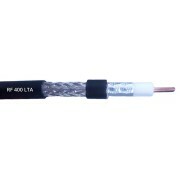 Dielectric insulation (mm) : low density PE, ø 7,25 ± 0,18. First braid : silvered copper, 144 x 0,16.
coverage : 96 % ( ø 7,90 mm ). Second braid : silvered copper, 168 x 0,16.
coverage : 98 % ( ø 8,60 mm ). 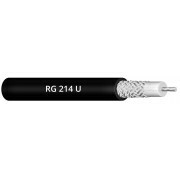 Marking : M-17/75 RG 214 MIL-C-17F RG 214 U 50 Ohm. 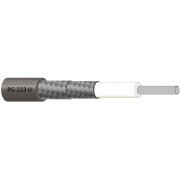 Inner conductor (mm) : silvered copper, ø 0,90 ± 0,025. Dielectric insulation (mm) : low density PE, ø 2,95 ± 0,10. First braid : silvered copper, 112 x 0,13.
coverage : 98 % ( ø 3,50 mm ). Second braid : silvered copper, 112 x 0,13.
coverage : 97 % ( ø 4,00 mm ). 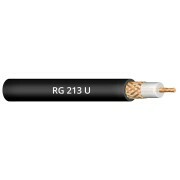 Marking : M-17/84 RG 223 MIL-C-17F RG 223 U 50 Ohm.